Pulsar are among the most exotic things in the Universe. These objects are rotating neutron stars emitting radiation from their magnetic poles. They appear to pulse because the magnetic axis is not aligned with the axis of rotation, so the pole comes in and out of view as the neutron star rotates. But pulsars are also puzzles. The conventional view is that their magnetic field arises from the movement of charged particles as they rotate. These charged particles ought to behave like a superfluid and so should end up becoming aligned with the axis of rotation. That’s clearly not the case since. What’s more, these kinds of superfluid currents are likely to be highly unstable, generating wobbles in the magnetic field. But pulsars are well known for being amazingly stable. How can this be? Another problem is how pulsars end up with magnetic fields that are so strong. The conventional view is that the process of collapse during a supernova somehow concentrates the original star’s field. However, a star loses much of its material when it explodes as a supernova and this presumably carries away much of its magnetic field too. But some pulsars have fields as high as 10^12 Tesla, far more than can be explained by this process. Today, Johan Hansson and Anna Ponga at Lulea University of Technology in Sweden suggest a clever way out of this conundrum. They point out that there is another way for magnetic fields to form, other than the movement of charged particles. This other process is by the alignment of the magnetic fields of the body’s components, which is how ferromagnets form. This makes neutron stars giant permanent magnets. Hansson and Ponga call them neutromagnets. A neutromagnet would be hugely stable, just like a permanent ferromagnet. The field would be likely to align with the star’s original field, which although much weaker, acts as a seed when the field forms. Significantly, this needn’t be in the same direction as the axis of spin. What’s more, since neutron stars all have about the same mass, Hansson and Ponga can calculate the maximum strength of the fields they ought to generate. This number turns out to be about 10^12 Tesla’s, exactly the value that’s observed in the highest strength fields around neutron stars. That immediately solves several of the outstanding puzzles about pulsars in a remarkably simple way. The theory is testable too. It predicts that neutron stars cannot have magnetic fields greater than 10^12 Tesla. So the discovery of a neutron star with a stronger field would immediately scupper it. But the idea also raises some questions of its own. Not least of these is whether it is even possible for neutron magnetic moments to become aligned in the way Hansson and Ponga suggest. The Pauli exclusion principle would, at first sight, seem to exclude the possibility of neutrons being aligned in this way. But Hansson and Ponga point to laboratory experiments which suggest that nuclear spins can become ordered, like ferromagnets. “One should remember that the nuclear physics at these extreme circumstances and densities is not known a priori, so several unexpected properties (such as “neutromagnetism”) might apply,” they say. Hansson and Ponga are the first to say their idea is speculative. Be that as it may, it also has a certain elegance and explanatory power that makes it worth pursuing in significantly more detail. 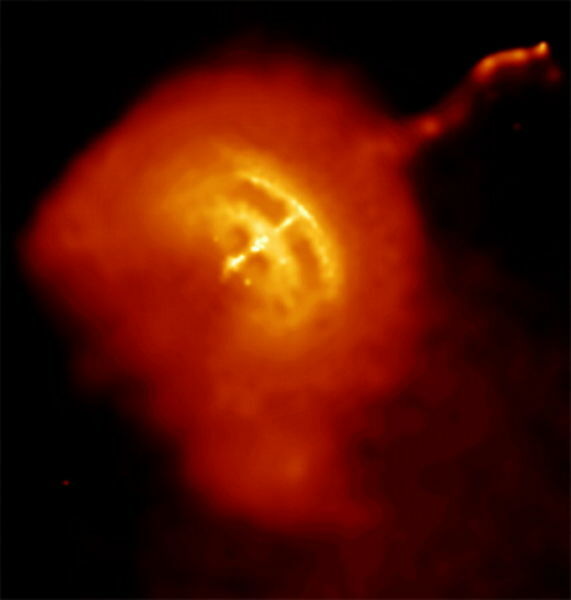 Ref: arxiv.org/abs/1111.3434: Pulsars: Cosmic Permanent ‘Neutromagnets’?